For ither uises, see Magas (disambiguation). Magas (Roushie: Мага́с) is the caipital toun o Ingushetie, Roushie. It wis foondit in 1995 an replacit Nazran as the caipital o the republic in 2002. In terms o population, Magas is the smawest caipital o a federal subject in Roushie: 2,502 (2010 Census); 275 (2002 Census). The Republic o Ingushetie came intae existence in 1992, haein been split frae the Chechen–Ingush ASSR. Nazran, the lairgest o three touns o the new republic, wis made a temporary caipital; housomeivver, it wis badly suitit for this purpose. In 1995, Preses Ruslan Aushev foondit Magas juist a few kilometres sooth o Nazran, namin it efter the medieval ceety o Maghas. The new toun wis supposed tae serve purely for admeenistrative needs. The preses' palace an the govrenment biggin wur biggit in rich oriental style, an a business destrict is unner construction. Toun status wis offeecially grantit tae it in 2000. Magas is the caipital o the republic. Athin the framewirk o administrative diveesions, it is incorporatit as the toun o republic significance o Magas—an admeenistrative unit wi the status equal tae that o the destricts. As a municipal diveesion, the toun o republic significance o Magas is incorporatit as Magas Urban Okrug. Народное Собрание Республики Ингушетия. Закон №5-РЗ от 23 февраля 2009 г. «Об установлении границ муниципальных образований Республики Ингушетия и наделении их статусом сельского поселения, муниципального района и городского округа», в ред. Закона №19-РЗ от 29 марта 2010 г «О внесении изменений в Закон Республики Ингушетия "Об установлении границ муниципальных образований Республики Ингушетия и наделении их статусом сельского поселения, муниципального района и городского округа"». Вступил в силу со дня официального опубликования. Опубликован: "Ингушетия", №26–27, 3 марта 2009 г. (People's Assembly of the Republic of Ingushetia. 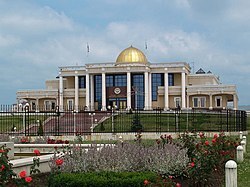 Law #5-RZ of February 23, 2009 On Establishing the Borders of the Municipal Formations of the Republic of Ingushetia and on Granting Them the Status of a Rural Settlement, Municipal District, and Urban Okrug, as amended by the Law #19-RZ of March 29, 2010 On Amending the Law of the Republic of Ingushetia "On Establishing the Borders of the Municipal Formations of the Republic of Ingushetia and on Granting Them the Status of a Rural Settlement, Municipal District, and Urban Okrug". Effective as of the day of the official publication.). This page wis last eeditit on 8 Mairch 2018, at 05:52.